Prepayment, including postage or courier fee, is required. All purchases are final. Please ask questions before you buy. Payment must be made in US dollars by US check, credit card, or wire transfer. US sales tax or European VAT tax are not applicable. Duties and import tax payable by customer. A pro forma invoice including shipping and other charges will be provided on request. Copyrights and intellectual property rights are retained by Clinical Device Group. You may view a CD as often as you like, share it with your company colleagues, and retain it for future training within your firm. CDs may not be copied, shared with individuals outside of the purchasing firm, or broadcast over private webcasts. Books and three-ring binder contents may not be copied without express permission. Our books and tools are intended to offer you the hard-to-find resources that are so difficult to locate for medical devices. We offer one of the first books on medical device biological safety ever written, (I claim this because I couldn't find any references for first edition!) as well as a quality management system, and a unique look-up tool for the biological safety "Matrix". In clinical research we offer five books, a quality management system, a circular calendar, a unique adverse event dictionary, a mousepad/notepad for adverse events, and an assortment of other "toys". Stark NJ, Biocompatibility Testing & Management, Fourth Edition, Clinical Device Group Inc, Chicago, IL (2003). As meaningful today as the day it was written, this book is divided into two parts. The first part describes the basics of biological safety testing, describing the most common test methods just enough so you can discuss them intelligently with your project team. The second half recommends a strategy for managing biological safety testing to assure you do the right tests, enough tests, but not unnecessary tests. Bench and in-vitro tests are always preferred to live animal tests because they conserve animals and are less costly. Perfect bound, illustrated, 350 pages. ISBN 1-889160-11-3. Table of Contents. $250.00 USD. Stark NJ, Biological Safety Quality Management System, Clinical Device Group Inc, Chicago, IL (1996). The Biological Safety QMS presents a prototype mission statement for the biological safety of medical devices, giving a typical job description for the individual within the firm holding biological safety responsibilities. The QMS presents editable procedures for requesting, ordering, reporting, and organizing test data. The manual is provided in a three-ring binder to encourage the addition of personal notes, and on CD so that editable files can be downloaded and personalized. References, CD and three-ring binder. Table of Contents. $275.00 USD. The Biocompatibility Matrix NotePad and MousePad is a ten-page notepad intended for taking notes and guiding your mouse. At the same time it is convenient tool for identifying the biocompatibility tests recommended by the famous "matrix". You first identify a device or material by nature of body contact and contact duration. Then you select the categories of biological safety tests recommended by the current version of ISO 10093-1 in black numbers and by US G95-1 in red numbers. The note/mouse pad measures 8 7/8" x 7 1/4 ", has 10 pages, and is a useful way to quickly make test selections. $8.50 US. View a close-up to see the wheel and read the test matrix definitions. The Adverse Event Wheel is a unique 'dictionary' of adverse event definitions taken from 21 CFR Part 812 and ISO 14155 Clinical Investigations for Human Subjects—Good Clinical Practice (2011). When an "event" occurs you spin the wheel until it lands on the set of characteristics that best describe the event: adverse or not, serious or not, anticipated or not, unanticipated or not, subject or caregiver, device-related or not, unreasonable risk or not, new information or not; and then identify the type of event that has occurred. Next you turn to the back of the wheel to double-check the universal definition. Reporting instructions tell the investigator and/or sponsor to follow the protocol and regulations. This pocket-sized (3.6"), laminated dictionary-wheel is a clever way to quickly categorize adverse events. $15.00 USD. View the animation to best understand how the dictionary works, and view the wheel back to read the adverse event definitions. The Adverse Event Pad is a convenient 'dictionary' of adverse event definitions for medical device studies. The definitions are taken from 21 CFR Part 812, ISO/DIS 14155 Clinical Investigations for Human Subjects--Good Clinical Trials (2010); and is suitable for both investigational sites and clinical trial sponsors. When an event occurs during a clinical investigation, locate its characteristics on the inner circles of the wheel, and then identify the type of adverse event from the outer circle. This note/mouse pad (8 7/8" x 7 1/4"), has 10 pages and is a useful way to quickly categorize adverse events. $8.50 US. View a close-up to see the wheel and read the adverse event definitions. Applied Regulations, Third Edition (2002) Stark NJ, Applied Regulations, Third Edition, Clinical Device Group Inc, Chicago, IL. (2002). Applied Regulations introduces the reader to the fundamentals of medical device regulations. Taking a historical approach, it begins with the ethical development of the Nuremberg Code and Belmont Report. 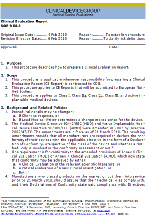 It progresses to the Food, Drug, and Cosmetic Act and 21 CFR Part 812. Next it takes a basic look at Europe and finally explains the "New Approach", reviewing the complimentary roles of Regulatory Bodies, Notified Bodies, and Standards Bodies. Finally there a historical review of the Declaration of Helsinki. The book concludes with a discussion of the useful and neglected role of the CIOMS (Council for International Organizations of Medical Sciences) international guidelines for "Ethics and Research on Human Subjects." Applied Regulations is a suitable introduction to people who are new to medical device regulations. Perfect bound, illustrated, 270 pages. ISBN 1-889160-02-4. Table of Contents. $250 US. Eventually you'll need to photocopy a document and then verify that it is a true copy of the original. For example, you may need to copy a medical report, a patient diary, an informed consent, or other document that belongs at the site. Stamping, signing, and dating a copy legally make it as good as the original on the date of copying. A Certified Copy stamp isn't essential, you can write the same words, but it is easy to spot on the page and is a tool for your monitors or study nurses that makes life a little easier. The stamp has a convenient footprint of 5/8" by 1 3/4". Description. $25 US. Clinical Evaluation Report Procedure and Template Stark NJ, Clinical Evaluation Report Procedure and Template, 2009. If you carefully read the GHTF Study Group 5 document on clinical evaluations or the MEDDEV 2.7.1 rev 3 guide for manufacturers and notified bodies on clinical evaluations, you'll learn that you need to incorporate a procedure for preparing clinical evaluations into your quality management system. We offer a step-by-step procedure and template based on the recommendations of GHTF Study Group 5, the requirements of MEDDEV 2.7.1, the essential requirements of the MDD 93/42/EEC, and the essential requirements of AIMD 90/385/EEC. Provided as Word documents and completely editable, they may be used to prepare clinical evaluations for the European market. Evaluations prepared by this method have been accepted by Notified Bodies. These proven instructions have been personally developed by Dr. Nancy J. Stark, requiring more than 80 hours of labor. USD $5000. Delivered by email. Stark NJ, Clinical Trials Design, Third Edition, Clinical Device Group Inc, Chicago, IL (2000). This is one of the few books about writing protocols and designing trials that links them to the trial hypotheses and product claims. That simple sentence sums up the guts and substance of the book: first decide what you want to claim about your device, and then design a trial to investigate it. The concept is so important and so rarely discussed that the book has been translated into Japanese and Korean. It is intended for use by medical device manufacturers. Perfect bound, illustrated, 300 pages. ISBN 1-889160-02-4. Table of Contents. $250 US. Stark NJ, Clinical Research Quality Management System, 2009 Edition, Clinical Device Group Inc, Chicago, IL. Clinical research quality management is essential if a manufacturer wants to produce a quality clinical investigation. Clinical research quality management should be a part of every firm's corporate quality management system. It should cover everything from trial concept and design, ethics, regulatory concerns, implementation, monitoring, project management, budgeting, contracting, adverse event handling, reporting, and organizing sponsor files. We offer editable Word documents of an entire system on CD, and an easy-to-read paper copy that is three-ring bound for notes and organization ideas. ISBN: 1-889160-18-0. Table of Contents. $3000. 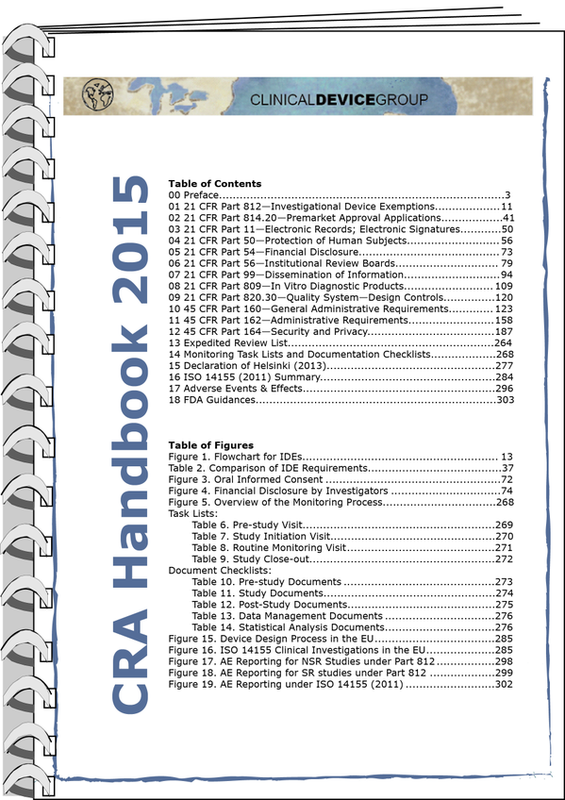 Stark NJ, CRA Handbook, 2015 Edition, Clinical Device Group Inc, Chicago, IL (2015). We designed the CRA Handbook to put the clinical regulations, FDA guidances, ISO 14155 outline and task lists, and checklists of clinical trial documentation in one convenient location. People tell us their old electronic handbooks are full of 'stickies', margin notes, highlights, and folded corners as they mark the paragraphs important to them. The 2015 version was updated to include the HIPPA regulations as regulatory reference material. The list of the diverse and often difficult-to-find FDA, DHHS, and OHRP standards was expanded. Many people want a paper copy for their briefcase and an electronic copy for their laptop. The paper edition is comb-bound, compact, lies flat for easy reading, and lends itself to field notes, and consists of 420 pages, and 19 figures and tables. ISBN 1-889160-24-4. $55 USD. Table of Contents. 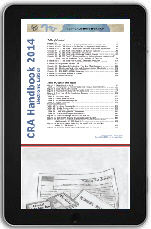 Stark NJ, CRA Handbook, 2014 Electronic Edition, Clinical Device Group Inc, Chicago, IL (2014). The illustrated handbook is offered as a secured non-printable pdf Acrobat document. It contains exactly the same content as the paper edition above. The 2014 is a complete resource for clinical regulations and FDA guidances, ISO 14155 outlines and task lists, and checklists of clinical trial documentation. People tell us their old handbooks are full of Acrobat notes in the margins; highlighted, underlining and comments on important text; unique bookmarked Tables of Content around unique keywords. The 2014 version was updated for consistency with new monitoring guidances, changes to FDA regulations, and the latest amendments to the Declaration of Helsinki. A list of the diverse and often difficult-to-find horizontal FDA guidances relating to device trials are enhanced with active links that take you directly to the related guidance on the web. The handbook contains total of 16 chapters and 19 tables and figures. Many people want an electronic copy for their tablet and a paper copy for their briefcase. Designed to upload to your hard drive, be fully searchable, and annotateable with Acrobat Writer; the 4MB file is delivered by email. ISBN number 1-889160-24-4. Table of Contents. $55.00 USD. The Date Wheel is a circular calendar. Some people give them to their investigative staff for calculating subject's follow-up visit appointments. Other people buy them for their project team to help plan project schedules. For example, I can set the arrow at today's date and count ahead, say, 8 weeks to get the date I'll finish a protocol. Then I move the schedule ahead another 4 weeks to get the date I'll finish the case report forms, and so on. Flexible and moisture-resistant, plastic laminated for endurance, pocket-size, 3 5/8" diameter. USD $10.00 each. Stark NJ, Good Monitoring Practices, Fourth Edition, Clinical Device Group Inc, Chicago, IL (2004). Monitors are the eyes and ears of the sponsor at the investigative site. They may be the first ones to recognize a non-compliance or adverse event and their job is to report them to the sponsor. Because monitors represent the sponsor, they need to understand exactly what the sponsor wants and needs. What are the regulations? What are the ethical issues? What are the medical risks? What are the sponsor's business considerations? Monitors must be able to assess all of these issues and make the frontline decision about reporting. This book is designed to give medical device monitors the knowledge and confidence they need. 240 pages, perfect bound, illustrated. ISBN 1-889160-02-4. Table of Contents. $250 USD. Investigators at independent sites may be new to clinical research altogether; investigators at teaching institutions are probably experienced in clinical research, but may be new to medical device rules. Both need training that is unique to device investigations as well as training to investigational device use; and you, as the sponsor, need evidence that training has been done. You should do two things: 1) train the investigative staff to proper use of the investigational device and document that you have done so, 2) train the investigative staff to device regulations and obtain evidence they understand them. The Investigator's Guide to Clinical Research introduces US regulations with some EU information for contrast, background for properly organizing a study site, US guidances critical for sites, example warning letters to show FDA's point of view, and seven sample site procedures. The book concludes with an optional exam. A Certificate of Learning and CEUs are available if the exam is returned to CDG. Three-ring bound, illustrated, 182 pages. ISBN 1-889160-19-9. Table of Contents. $100 US. Probably the most overlooked aspect of device investigations, project management is absolutely essential if a trial is to be implemented on time and with care. The book follows the usual outline of any project: conception, planning, implementation, reporting, and close-out; but focusing on clinical research. It gives sample planning forms, Gantt charts, budgets, methods for cost analysis, reporting metrics, and sample CRO contracts. If you are in management you should insist your staff read this book, it is my personal favorite of all the books I've written. 290 pages, perfect bound, illustrated, ISBN 1-889160-09-1. Table of Contents. $250 USD.